The Hetch Hetchy Valley, located near Yosemite, has been described as being like a slightly lower, drier and warmer Yosemite. Notice the waterfall, center left. 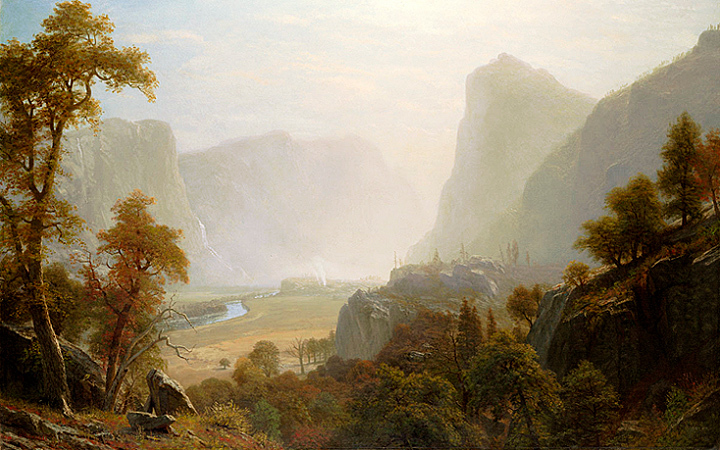 19th century oil painting of Hetch Hetchy Valley. 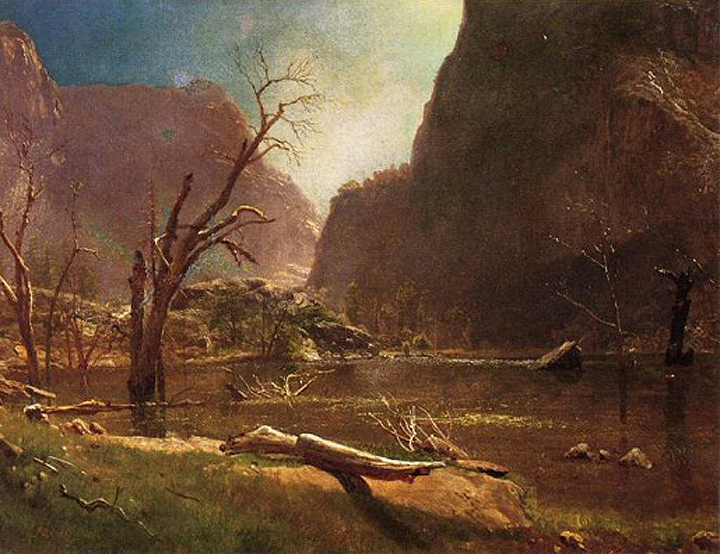 Hetch Hetchy valley as painted by Alfred Bierstadt, 1890s. Hetch Hetchy valley is in Yosemite National Park, about 190 miles east of San Francisco in the Sierra Nevada Mountains. In 1902, ex-Mayor James Phelan of San Francisco filed a claim with the federal government for the water from the Tuolomne River, which would be gathered by damming the mouth of the Hetch Hetchy Valley. Initial opposition came from the lightly populated eastern Central Valley where there were two irrigation districts in Modesto and Turlock with their own eyes on the Tuolomne River watershed. The most outspoken opposition to San Francisco's plans came, however, from the nascent preservation movement, led in this case by the famous John Muir. The federal Right of Way Act of 1901 provided the legal basis for the city to acquire rights to national park land, but the then-Secretary of the Interior Ethan Allen Hitchcock refused to give SF a permit, preferring to protect Yosemite's natural wonders. The plan languished throughout the first decade of the century, in part due to the corrupt regime of the Union Labor Party under Boss Abe Ruef, which attempted to strike a deal with the Bay Cities Water Company in exchange for a million dollar bribe. When Ruef and the ULP were exposed and put on trial soon after the earthquake of 1906, the water issue re-emerged in the glaring national spotlight that followed the spectacular destruction and fire. Hetch Hetchy proponents were quick to use the conflagration as proof of the necessity of new water supplies for San Francisco. Echoing contemporary struggles over the environment, President Theodore Roosevelt's early initiatives in parkland creation and wilderness preservation were under attack. By 1908 Roosevelt's Interior Secretary James R. Garfield reversed the earlier order, and issued a limited permit for the Hetch Hetchy project, in part to quiet critics who thought public resources should be developed rather than locked away. The Sierra Club, still in its infancy, found itself divided over the Hetch Hetchy proposal with a strong proponent in one of its founders, Warren Olney. John Muir rallied other groups, such as the Appalachian Mountain Club and the Saturday Walking Club in Chicago, to oppose the plan, but lacking the active participation of California conservationists, the campaign was unable to derail the project. In January 1910, the City held a bond referendum in which voters approved a $45 million bond to build the first phase of Hetch Hetchy, but rejected a $35 million bond to buy out the Spring Valley Water Company's facilities. 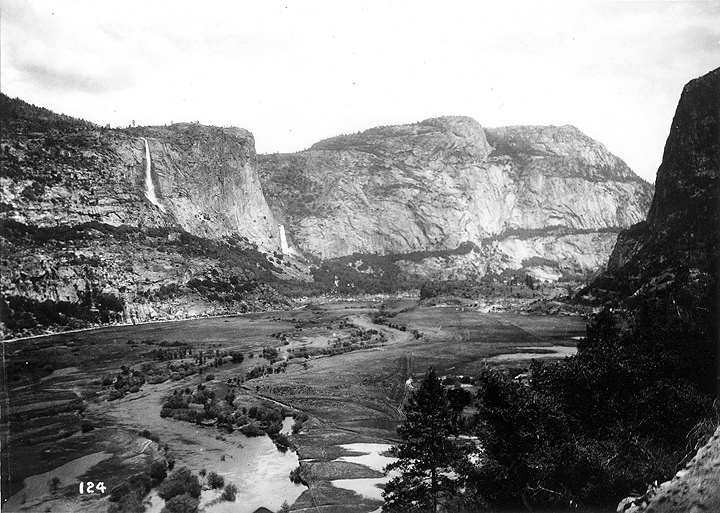 The arguments of the preservationists were focused on saving Hetch Hetchy Valley for public use. The arguments presented by the City and its paid engineers and lobbyists were also focused on public use, but instead of arguing for public recreational uses, they argued for a grand water-and-power system to supply water and electricity to San Francisco and the entire Bay Area for decades to come. Given the era and the prevailing pro-development values (hardly changed to this day, after all), it is not surprising that the congressional committees created to analyze the controversy opted to allow the city to build the Hetch Hetchy dam. Finally, President Woodrow Wilson signed the Raker Act on December 19, 1913. M.M. O'Shaugnessy oversaw the gradual construction of the network of dams, reservoirs, tunnels, and powerhouses to deliver water and power to SF. In 1923, San Francisco revoked Spring Valley Water Company's franchise and began rebuilding the water mains and plumbing for the citizens of San Francisco. A hydroelectric powerhouse was built and enough copper wire purchased to stretch from the Sierras to San Francisco. In 1925, it was abruptly announced that San Francisco had run out of money and could not complete the power lines into the city. The city's line ended a few hundred yards from PG&E's Newark substation on the eastern side of the south bay, conveniently close to PG&E's just-completed high-voltage delivery cable from Newark to SF. In late October 1934, the system finally brought water into the city, but its power transmission lines never reached beyond PG&E's Newark substation on the eastern side of the south bay. 2. (op.cit. from private Phelan papers, Bancroft Library, UC Berkeley).